I woke up on Sunday morning and actually said (out loud) “Oh, the sun is out today.” Yep. It’s been that bad here in Connecticut. We’ve had days, maybe weeks, of rain and or cloudy skies. It’s getting monotonous. And depressing. I think that I must be one of those people who is affected by the weather, or does everyone feel this way? A little later that morning, I started styling the bookshelves in our living room. It is a project that has been on my “to do list” for a while, but I was struggling mentally. I was torn between finishing the task at hand (because it was coming together nicely) and getting outside to the garden. The sun won. Weeding is not my favorite job, but I was willing to do just about anything to soak up the sunshine! Although the garden plants are young and just sprouting, I physically needed to be near something green and flourishing. I love the seasons, but there is something really mean about waiting patiently for the warmer weather of spring – only to reach for an umbrella on a daily basis. I can only hope Mother Nature is planning a spectacular flower show in May. Since I can’t bring the outside in, I’ve been toying with the idea of getting a houseplant. 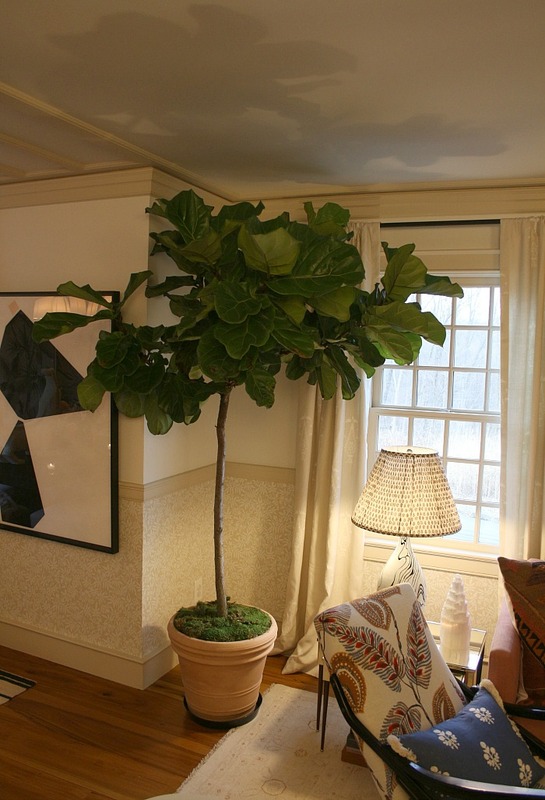 I saw a gorgeous Fiddle Leaf Fig tree in One Kings Lane’s President, Debbie Propst’s home in New Canaan, CT that give me some inspo. Bringing “green” into your home can really transform a space, not to mention the other positive benefits. As far as where to buy them, your local nursery probably has a green house and even Home Depot and Whole Foods sells them. Having a plant inside your home brings energy to the environment and has been shown to help lift spirits. 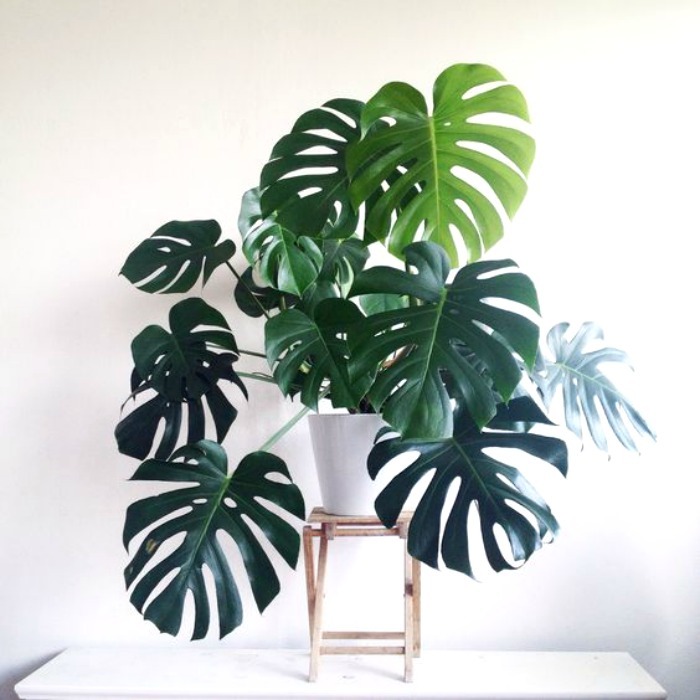 Plus, another bonus of houseplants is the fact that they provide oxygen and can purify the air. While I’m sure it is a nominal amount, it doesn’t hurt to get some extra O2 into the atmosphere! 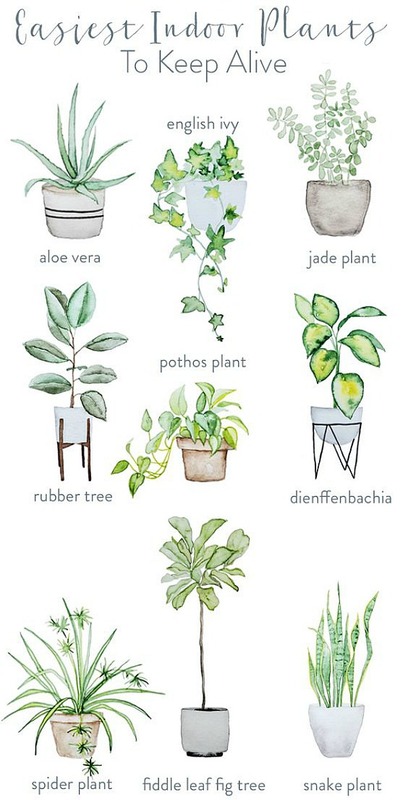 Below is my roundup of five easy care houseplants that will brighten and lighten your home – and how to care for them. I prefer white containers for plants because it helps make the color pop. Be sure to protect your floors by using a plant stand or a round cork mat beneath the pot. 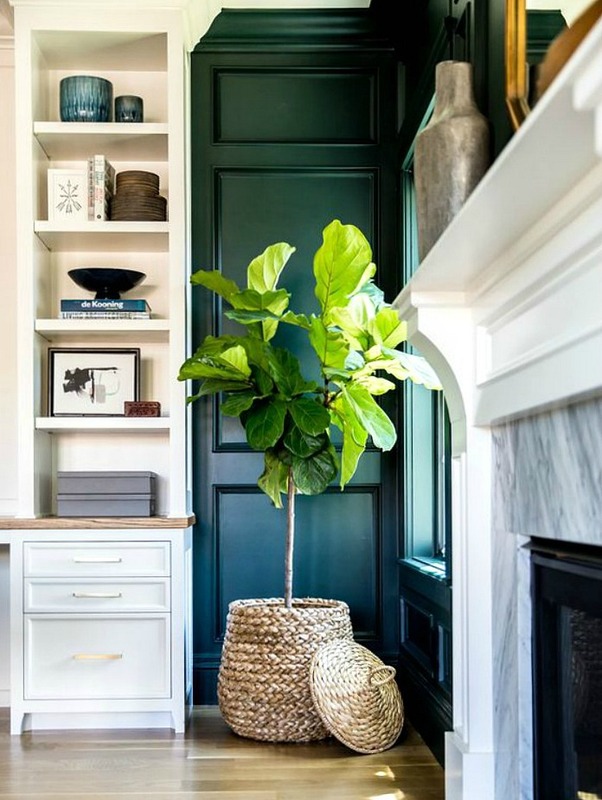 Fiddle Leaf Fig Tree – Theses plants are cat-like. They love to be near a window in bright, indirect sunlight. Also like cats, they like to be loved on, so don’t shy away from wiping dust off the leaves. Water thoroughly when the soil feels dry to the touch. 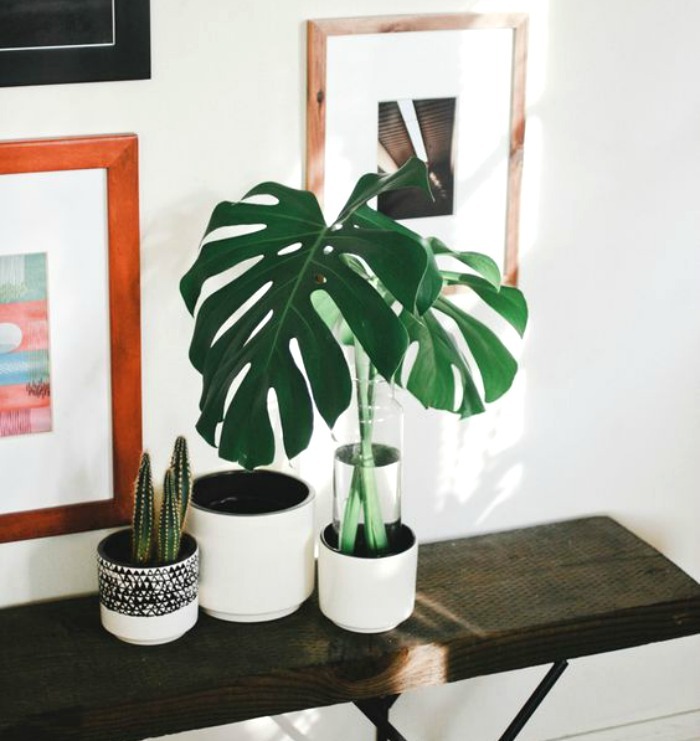 Split Leaf Philodendron – This one doesn’t like direct sun, so it is a good choice to liven up a dark spot in your home. Water thoroughly when the soil feels dry to the touch. If it gets out of hand, trim off a few of the leaves and place them in a vase with water to freshen up another room. 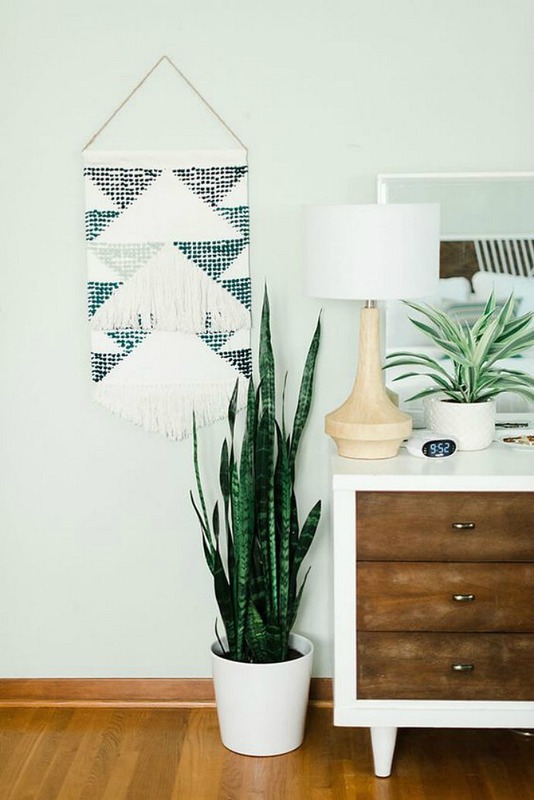 Snake Plant – I think these plants are so cool looking! They will thrive almost anywhere in your home. Because they have many qualities as a cactus, they need very little water. Most houseplants prefer to be almost dry before you water them. This one retains water, so wait until the soil is really dry. 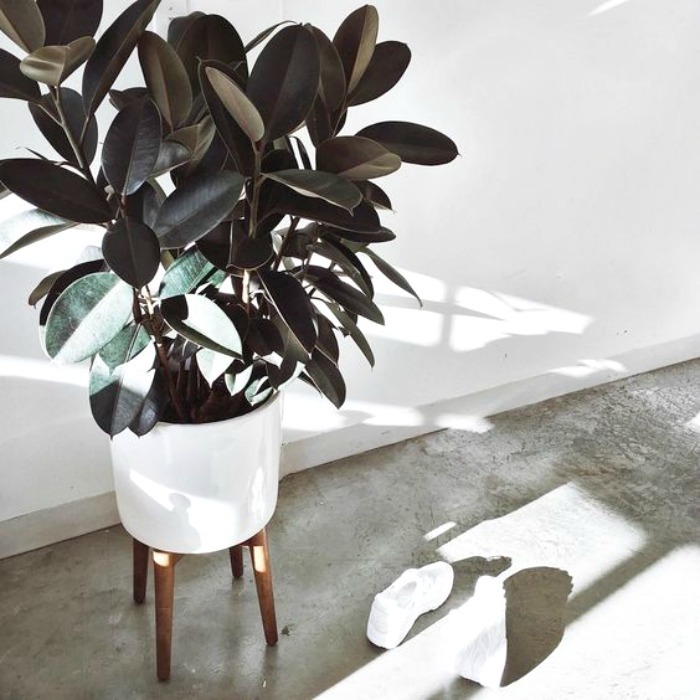 Rubber Tree – This plant likes bright light. Keep the soil moist from spring to fall (growing season) and in the dormant months, water sparingly. 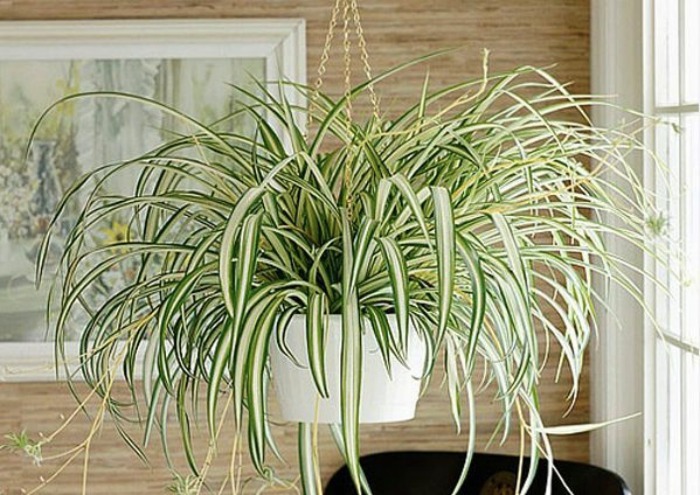 Spider Plant – During the first year, water occasionally. After that you should water moderately. In the spring and summer months keep the soil moist. Do not let soil dry out. You should fertilize twice a month in the spring and summer, but do not over-fertilize.